"Can't catch me!" sang Jake. "I'm the fastest mouse in the world!" 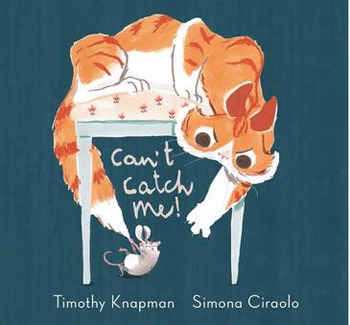 Timothy Knapman is a children's writer, lyricist and playwright. His children's books have been translated into twelve languages and include Soon, illustrated by Patrick Benson, Time Now To Dream, illustrated by Helen Oxenbury, Dinosaurs Don't Have Bedtimes, illustrated by Nikki Dyson, and the bestselling Mungo and the Picture Book Pirate series. His titles have often been featured on CBeebies Bedtime Stories. He lives in Weybridge, Surrey. Simona Ciraolo studied animation at the National Film School in Turin, Italy, before moving to the UK, where she worked in advertising, children's television and on feature films. She then went on to undertake the prestigious MA in Illustration at the Cambridge School of Art, where she was awarded the Sebastian Walker Award 2014. Born in Sardinia, Italy, Simona now lives in London.